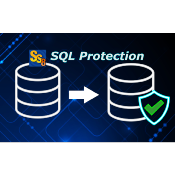 SureSync SQL Protection from Software Pursuits provides the most cost-effective and easy-to-use solution for protecting mission critical SQL databases on MS SQL Server or SQL Express. Automate SQL backups using SureSync's simple user interface. You can schedule Full, Incremental & Differential backups of your SQL databases. SureSync SQL Protection can continuously & automatically restore your SQL backups into standby servers to validate backups and speed recovery. There is no limit to the software to the number of size of databases to backed up. SureSync SQL Protection is licensed per source server, no matter how many SQL Instances or SQL databases are on that server. There is no license requirement for the target server(s) making this possibly the least expensive near rea- time backup solution for your SQL databases. Contact Software Pursuits for a free, no obligation 30 day trial.